Two Michiganders are using micro-distilling to pay homage to a fish long gone from their state while turning their hobby into a full-fledged business. Two Birds Artisan Spirits, founded by Kalamazoo residents Ryan Bailey and Nathan Jonjevic, has created its first small-batch spirit called Greyling Modern Dry Gin. 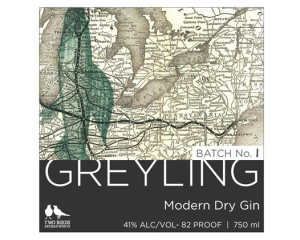 Greyling Modern Dry Gin features a map on its bottle with the grayling fish superimposed over the top of it. Along with its Michigan flavor, the gin, recently awarded a Gold Medal at the 2013 San Francisco World Spirits Competition, features a unique name. It is named after the Arctic grayling populations that once lived in Michigan; they are now gone from its waters, according to the U.S. fish and Wildlife Service. The grayling makes a return to Michigan by being on the bottle’s label. Appearing on shelves and bar tops, the fish is once again getting recognized by gin connoisseurs. Another connection: The grayling population died off in Michigan about the time small scale distilling died off due to prohibition. While naming their gin for the fish, they opted for the unconventional spelling of grayling. One reason was to avoid the association with the town of Grayling in Michigan. 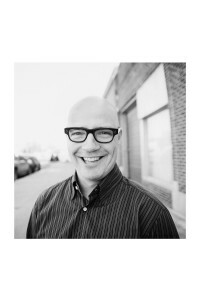 “There’s absolutely nothing wrong with Grayling, Mich., however neither our company nor our gin have a direct connection to that town,” Jonjevic said. Another reason is that the duo felt that the Greyling spelling looks better on the label. An Internet search for grayling produces images of fish and information about the Michigan town. An Internet search for Greyling produces information about Greyling Modern Dry Gin. The gin’s bottle features a map with a grayling fish superimposed on the top of it. 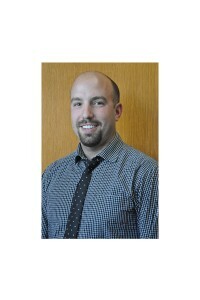 Ryan Bailey, co-founder of Two Birds Artisan Spirits. Image: Two Birds Artisan Spirits. The map adds a historical visual to the gin’s Michigan-based flavor. The micro-distilling company caters to those with a taste for regional flavor.The gin is well balanced, slightly sweet, and with a floral nose, Jonjevic said. Gin enthusiasts are finding Greyling to be a good mix for most cocktails like Gin and Tonic, according to Aaron Knoll, who wrote about it in his the Gin is in blog. The creators use as many ingredients from Michigan as possible. Gins tend to fall into one of two categories: juniper forward or played down juniper. Juniper, a spice made from coniferous trees, has a taste that resembles where it comes from: pine needles. It is always in gin, but changing other ingredients allows different flavors to appear. Gin spirits feature Juniper tastes derived from Juniper berries like these. Two Birds Artisan Spirits hopes to compete with Michigan’s well known micro-brewing of beer. The owners’ hope that micro-distilled products will take off where micro-brewing started, just gaining a name and fan base. If the gin does well, Two Birds Artisan Spirits plan for a distillery in southwestern Michigan. Purchasing information for Grayling Modern Dry Gin can be found here. As for the spelling Issue, I’d have to say that the story here explains the unique spelling. I tried the Google idea and the story is correct, I found images of fish and information on towns. Smart move to pay tribute to the fish/michigan and tweek the name a bit don’t ya think? Uh, like it says, grayling the fish, is spelled with an a not an e. If you want to name something after a fish, you should spell the name of the fish right. The Grayling which were in Michigan were Eastern Grayling, not Arctic. Eastern Grayling are now extinct.